Tom died Friday about 5 pm after a 19 month struggle with first colon cancer and then liver cancer. He will be cremated and have a Mass here. Funeral service will be on Saturday, 6 October at 12:00 PM at St. Philip Catholic Church, 1897 W. Main Street, Lewisville, TX 75067-3250. Tom Moore's funeral is at 1000, 17 Oct, at the West Point Cemetery. 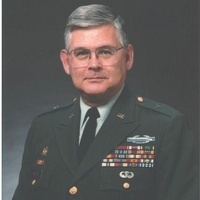 Please let our USMAPS ‘57 Classmates know that Brigadier General (USNG, ret.) Thomas Joseph Moore, has died. At Stewart Field, Tom was a member of the 3rd Platoon, and one of my roommates. 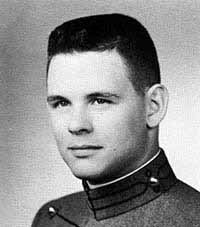 He entered West Point with the Class of 1961, and graduated with the Class of 1962. He held closely his valiant fight against cancer. Oh Barbara, such an incredible loss for all of us who knew, served with, and loved Tom. He has been another brother, a comrade in arms and a role model for me. Nothing will be the same now. He was supposed to always be there for all of us. My heart goes out to you Barbara; but you should know That he never had true love and happiness until you entered his life. He told me that. I’ll think of Tom whenever I hear the pipes playing. Godspeed, Thomas Joseph Moore, into the mighty arms of The Lord. God be with you and the rest of his family. Thomas Joseph Moore was born July 4, 1938 on Corregidor in the Philippine Islands where his Army dad was stationed. His parents, brother and two sisters moved around a great deal, spending time in Europe, the Pacific and Texas. At age 9, at Fort Bliss, he joined the Cub Scouts and at age 11, in Norfolk, Virginia, he joined the Boy Scouts. He returned to Fort Bliss and attended high school there but ultimately graduated from Hampton High in Hampton, Virginia. After high school, he went to college at West Point Military Academy where he graduated in 1962. He joined the 82 Airborne Division and completed a tour in Vietnam. His military tours have taken him to Delaware, Oklahoma, Georgia, North Carolina, Turkey and Kansas. After his Army service he moved to California and joined the California National Guard to work full time as a civilian. He served 20 years, retiring as a General. He then went to work for the Los Angeles County Sheriff’s Office. While in California, Tom rejoined the Boy Scouts as an assistant scout master and went to work for two civilian companies, retiring at last in 2004, when he and his wife, Barbara moved to Flower Mound, TX. There they joined Saint Philip the Apostle Catholic Church where he was involved in various ministries. In 2005, Tom joined the Knights of Columbus and was Rookie of the Month and in September of 2006, he received his Fourth Degree. He also joined Boy Scout Troop 451, first serving as Troop Chaplain and later as counselor for the Eagle Badge. During his time in Scouting, he earned the Order of the Arrow, the Eagle Scout Badge, the Bronze Pelican Award, the St. George Emblem, his Wood Badge Beading and the Jerusalem Cross.